Table: Validated primer sets for human and mouse housekeeping genes and their expression levels. * Summary of the expression levels of genes in comparison with 18S rRNA using our sensitivity human or mouse reference cDNA and our proprietary SYBR green master mix. 95°C, 10 minutes -> (95°C, 15 seconds. -> 60°C, 30 seconds.) for 40 cycles -> melting curve. 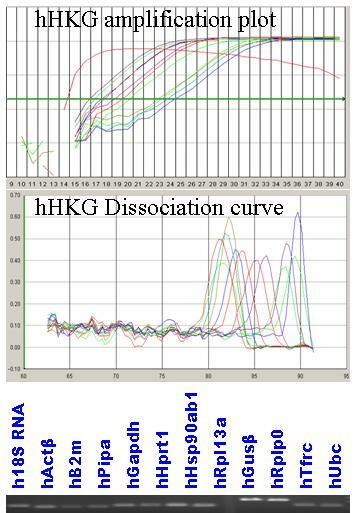 Figure: Standard curve for housekeeping gene hprt1 expression at medium levels.